In the spring of 1927, the modern world was born. Or at least the great interconnectivity of modern social life rose up and declared itself in the spring of 1927, with two key events. The first was Charles Lindbergh's winning the race to make a solo non-stop flight across the Atlantic from New York to Paris. The second was Calvin Coolidge’s decision to spend the summer in the Black Hills of South Dakota. The first hardly needs much explanation, although we tend to forget just how much the young and photogenic Lindbergh seized the world’s imagination. Waiting to cheer him as he landed at Le Bourget airport were 150,000 Parisians. On his return to New York, perhaps 4 million Americans turned out to see him on a day with a ticker-tape parade, speeches in Central Park, and grand banquets. The French bestowed on him the Légion d’honneur, and the Americans gave the young Army Air Service reserve captain both the Distinguished Flying Cross and the Medal of Honor. Calvin Coolidge may seem a less dramatic and idolized figure, mostly because he was, in fact, a less dramatic and idolized figure. But his extended 1927 stay in the West signaled, as clearly as a transatlantic flight, just how much the world had changed. Presidents had fled the summer heat of Washington before, of course. James Buchanan retreated to Bedford, Pennsylvania, and Benjamin Harrison to Cape May, New Jersey. Woodrow Wilson got all the way to Cornish, New Hampshire. But before the 1920s, these trips had all been in the eastern United States, to ensure that the president could receive regular mail and return quickly if some emergency arose. 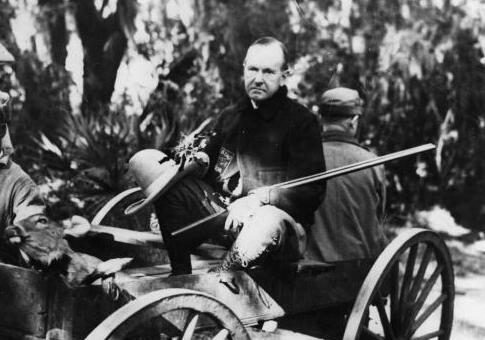 Coolidge’s three months at the Game Lodge in Custer State Park were proof that the combination of trains and airplanes, joined to the completion of the telegraph system and the emergence of the telephone system, had brought the western United States into continuous contact with the East. Coolidge visited the Black Hills in part because, for the first time, a sitting president could. He left Washington on June 13, 1927, with an entourage of 80 assistants, guards, and reporters. He wouldn’t return until September 11, exactly 90 days later. A new monograph, Calvin Coolidge in the Black Hills, charts the president’s journey. A slim volume from the History Press, the book proves a quick but well-researched guide to that summer: a nice supplement to such works as Amity Shlaes’s magisterial 2013 biography, Coolidge, and the president’s own 1929 memoir. Written by Seth Tupper, a reporter at the Rapid City Journal, the book sets out to examine such questions as why the president chose to travel west and why he used the trip to make the announcement that he would not run for president again in 1928. Calvin Coolidge in the Black Hills mostly refuses to answer its questions. Tupper seems to have an allergy to firm conclusions about anything other than small, well-documented facts, and his preferred method is to present all the possible theories for a bigger explanation, leaving the reader to decide. That’s not necessarily Tupper’s fault. The thoughts of the notoriously taciturn president are often difficult to discern. Silent Cal had a subtle sense of humor and took a quiet delight in watching others flail at interpretation. As self-sufficient as any American politician has ever been, Coolidge was one of those rare people who appreciate a private joke—and one of those even rarer people who feel no need to explain, even to those close to them, why they find something amusing. It certainly amused him to watch, for example, the nation’s press run rings around itself trying to parse his August 2, 1927, announcement about the re-election campaign (a written statement, handed out to reporters, that read in its entirety, "I do not choose to run for President in nineteen twenty eight.") But why he made that choice remains a curious question. As Suzanne Barta Julin, a historian of the area, once noted, "Coolidge had brought the presidency to the Black Hills and relinquished it there." Coolidge hardly mentions the Black Hills in his autobiography, and the standard view of his reason for visiting involves the McNary-Haugen Farm Relief Bill. Despite passing a Republican congress, Coolidge vetoed the bill on February 25, 1927, calling it "an economic folly from which the country has every right to be spared." The nation’s newspapers drummed up a storm of reports on how western senators and congressmen were ready to revolt, pushed into action by their angry constituents out on the farms and ranches. In this interpretation, Coolidge needed to shore up support before the 1928 election and hoped that an extended, well-reported trip to South Dakota would help. Tupper points to efforts of the dynamic South Dakota senator, Peter Norbeck, a progressive Republican with dual motives. A consistent booster of his state, Norbeck wanted to promote local tourism by getting Coolidge to visit the Black Hills. At the same time, he wanted to expose the president to the unpopularity of vetoing the farm bill and use the long train ride to whisper in Coolidge’s ear about the need for agricultural relief. But Norbeck’s second purpose failed. Coolidge discovered that his trip was received ecstatically across the West, that revolt over McNary-Haugen was a fantasy limited mostly to Washington, D.C., and that the good weather of 1927 was already easing some of the worry about agriculture. Tupper points to the problem with interpreting South Dakota’s Summer White House as a response to the farm-bill veto. If Coolidge went there to gather support for 1928—and found that his support was high—then why did he announce so quickly that he wasn’t going to run for re-election? In his autobiography, Coolidge mentions his son’s death as having taken the joy out of public life. Tupper dwells a little on the short-lived scandal of Mrs. Coolidge’s spending too much time with Secret Service agent Jim Haley (whom Mr. Coolidge then ordered back to Washington), but rightly concludes that the brief marital discord was not a major cause of the president’s decision. Did Coolidge see the Depression coming? (H.L. Mencken thought so.) Was he moved by George Washington’s eight-year tradition, since, having inherited the presidency when Warren Harding died, reelection would take him to nine and a half years? Did he feel that he had accomplished all he had set out to do? Seth Tupper leaves the answer for his readers to decide. The book, however, does contain a strong suggestion that Coolidge was disingenuous when he would later write that he had never intended to run. Tupper points to the uncharacteristic playfulness that Coolidge revealed that summer of 1927. He donned a long eagle-feather war bonnet on a trip to the Pine Ridge Reservation. He showed off the fancy riding chaps he had been given and wore an enormous ten-gallon cowboy hat to the rodeo in Belle Fourche. He fished (in a secretly over-stocked section of the local creek), rode horses, and panned for gold. He motored to Rapid City most days to work at the high school the administration had taken over for White House business, and he went to hear a young assistant pastor preach in the town of Hermosa on Sundays. Mostly he seemed to relax and enjoy himself—a circumstance, Tupper notes, that may well have been caused by his having finally resolved to give up the presidency. Calvin Coolidge in the Black Hills is a fine small study, well documented and filled with fascinating details. (Or fascinating to me, at any rate. Tupper notes the story of a New York reporter flipping a dime tip to a successful local landowner—my great-uncle, as it happens—who had volunteered to help chauffeur the White House entourage during the presidential train’s stopover in the state capital of Pierre. Family legend says he kept the dime.) Lindbergh flew over Rapid City and Custer State Park while the president was there, dropping notes from the air. All summer, Washington politicians, Coolidge’s personal friends, and grandees from across the West came to visit the president at the state game lodge. The most important chapter in Calvin Coolidge in the Black Hills, however, may be the one about Coolidge’s mail. The post office arranged for additional flyers to gather in North Platte, Neb., the closet field in the chain of air-mail stations that were being established from the East Coast to the West Coast. Several times a week, the aviators would fly their U.S. Mail planes up to Rapid City, delivering the president’s correspondence and keeping him in touch with the government in Washington. South Dakota would profit from the president’s visit. Summer visitors routinely number three or four times the state’s population. Coolidge’s support for the carving of Mount Rushmore made the project possible, and the designation of the Badlands as a national park helped preserve those strange hills as a second tourist destination. Even more, however, Calvin Coolidge’s stay in the Black Hills proved that technology had brought the various parts of the nation within daily, even hourly, touch of one another. We may think of the computer and cellphone revolution, playing out in the 1990s, as the great speeding up and interconnecting of American life. But the technological changes of the 1920s were equally far reaching, with effects just as wondrous. And just as baleful.